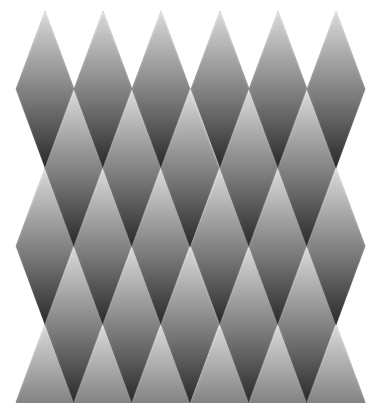 This week's Excel optical illusion is called Shaded Diamonds. Which row of diamonds is the darkest? Which is the lightest? Would you believe they are all the same? This advanced Excel chart is interactive and has a scroll control that spins a diamond revealing the truth. I think this is one of the more interesting charts that I've shared. Can you figure out how it's done? In creating your Live Calendar, how do you take a picture of the calendar and put it into another worksheet and have it update automatically? I'm using Excel 2002. Loved the calendar discussion! You have a great blog! Keep up the good work! You just need to select the calendar (well actually, all of the cells that make up the calendar) and then click the Camera Tool. This will place a blinking outline around those cells, similar to what happens when you copy cells. Now go to where you would like to place the calendar and click that location on that worksheet. 1. You may not have the camera tool displayed by default. If not go to the Tools menu and select Customize. Under Categories select Tools and under Commands, scroll down to Camera. Click on the Camera icon and drag it up to one of your toolbars and drop it there. Now you should be able to use it as described above. 2. The resulting picture of the calendar is really like an embedded image, but the image is of the initially selected cells, and is live (if you change what's in the cells either manually or the formulas change their results, the image updates instantly). This image can be resized and often needs a slight adjustment in the size to make the text appear sharp. Experiment a little an you'll get it. This page contains a single entry by Daniel Ferry published on April 23, 2010 1:07 PM. Excel Optical Illusions #9 was the previous entry in this blog. Excel Optical Illusions #11 is the next entry in this blog.